He can professionally guide you not only with your weight training or cardiovascular regimen, making you more muscular and fit. But, he can also utilize his nutrition knowledge in helping you get lean as well. Kyle’s unique background filled him with experiences that he can leverage to help you achieve your own fitness goals. He began lifting weights and hiking with his Marine father when he was just 4 years old. The following year, Kyle found a passion for wrestling and became one of Wisconsin’s elite wrestlers, earning both state and national wrestling titles. Meanwhile, his Portuguese mother taught him the importance of utilizing proper nutrition to maintain his powerful physique. On November 4, 2017, Kyle participated in the Vermont Power Lifting Competition “Old School Iron Wars.” At this event, he took the overall champion with a total weight lifted 1,587.32 pounds. Individual lifts were Squat: 551.15, Bench: 496.05, Deadlift: 540.13. 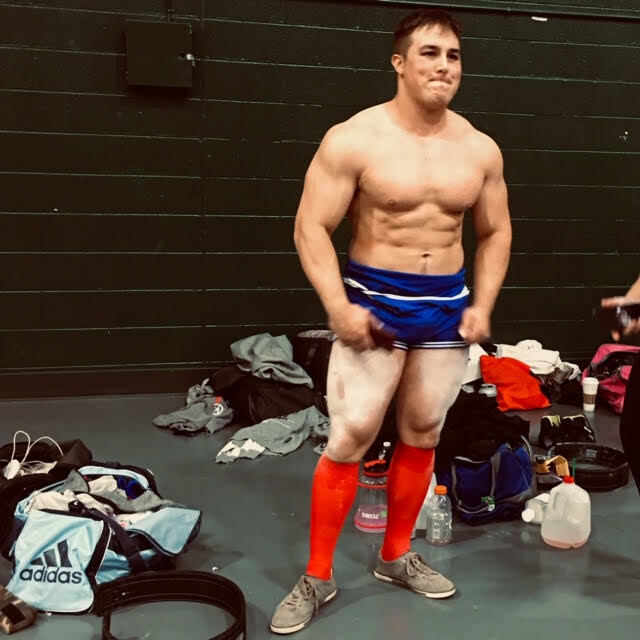 Continuing his Power Lifting career, Kyle traveled to Dayton, Ohio to compete in the IPL Midwest Open on October 27, 2018. At this event, he upped his numbers significantly with dedicated training and working with a power lifting coach. Kyle earned 2 WORLD RECORDS. Lift amounts were: Squat: 650, Bench: 512 (World record for Junior 275 weight class), Deadlift: 650, 3 lift Total: 1812 (World Record for Junior 275 weight class) He hopes to advance his Power Lifting career over the years. Having a trainer who pushes himself as hard as Kyle guarantees he will research YOUR needs to create the best workout for you. Kyle has also competed in bodybuilding in the physique category. When preparing for his first bodybuilding show, he began meal planning for himself. He creates delicious, nutritionally sound meals based upon total daily energy expenditure and figuring out macro-nutrients required. Kyle can assist you in helping to create a sustainable meal plan to achieve your fitness goals. Kyle works with each individual’s base line health and works towards goals in a motivating, safe manner. He wants to share and promote a healthy lifestyle, positive change, and self confidence due to his lifelong commitment to his own health, physique, power, and strength. one FREE training session with Kyle. Join our mailing list to receive class updates, special event information, seasonal deals and much more.